City council chiefs are set to push ahead with controversial plans to make every Granite City cab wheelchair accessible – despite the UK government saying they don’t have to. Plans were first approved in 1994 to make all the city’s taxis disabled friendly with the local authority long arguing that they were under a legal obligation. Last year, councillors voted to delay a decision on implementing the scheme while they sought clarity on the law from Westminster. But a new report to the city’s licensing committee provided an update that the UK government “are not implementing any mandatory rules” on the number of disabled taxis. 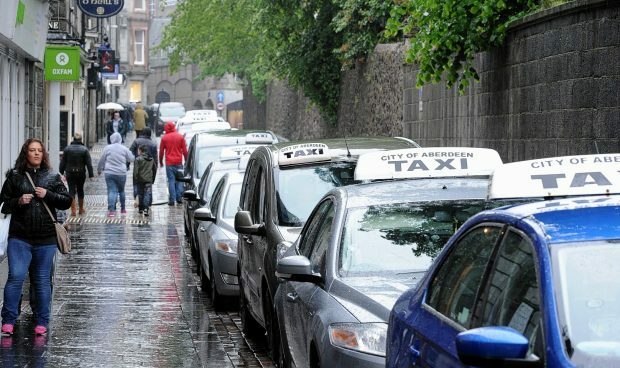 Aberdeen has operated with a mixed fleet although the number of disabled cars is thought to have increased fivefold since 1994 and now make up around 40% of taxis. Dundee also operates a mixed-fleet system while Edinburgh and Glasgow have traditionally used black cabs, which are wheelchair-accessible. But officers have recommended councillors push ahead with the “100% accessible fleet” and propose a final implementation date of June 6, 2018. Last night the news provoked anger in some quarters – with one driver of 25 years warning that more would leave the trade with huge bills to upgrade their cars. But a report to councillors reads: “Whilst the government have confirmed there will be no mandatory quotas for accessible vehicles there is equally no suggestion that the policy is unlawful. But taxi driver William Marr said the move would hit hard-pressed cabbies affected by the oil downturn hard. He said: “Lots of people have stopped in just the last few years, we have all been badly affected by the oil downturn. “Just now about 40% of the cars are accessible for about 1% of the population who need them. “I know a lot of customers with disabilities and older people absolutely hate them, they’re basically converted baker’s vans. “Now we know the government doesn’t require a full accessible fleet it seems to me that the council are just pursing a political agenda. But Alan Logan, who drives an accessible car and has been in the trade for ten years, said: “I think it should maybe just be a percentage that are accessible. Guide dog user Mary Rassmussen said she was no fan of accessible cabs. She said: “Such taxis are high and bumping your head is sore. “The steps are difficult to climb as finding the handle to heft up is not easy and missing the step and grazing your shin is horrid. The dog cannot guide up steps as the opening is too narrow. Dame Anne Begg, the first female MP in a wheelchair who now chairs the Disability Equity Partnership, said there were “mixed views” on the issue. She said: “Some disabled people are more in favour of a mixed fleet as some struggle with the accessible cars while others want all fully accessible. The licensing committee will meet next Wednesday.